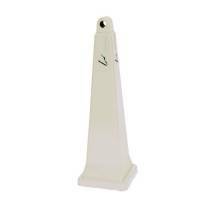 Beige Plastic Pyramid Style Ash Stand 1001x311x311mm 324133 Pack of 1 "Galvanised steel chamber restricts the flow of oxygen to discarded cigarettes, helping to extinguish them quickly. Easy to empty. Weather resistant. H1001 x W311 x D311mm. Optional weight ring available separately. Non returnable." Silver and Black High Capacity Smoking Ash Stand 370785 Pack of 1 Sophisticated all metal construction. Capacity 25.4 litre. Weighted base to prevent theft and breakage. Easy to empty and clean. Domed top for weather resistance. H1010 x D400mm. Non returnable. 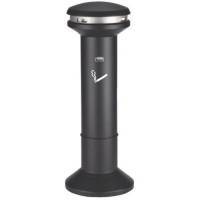 Q-Connect Black 2.7 Litre Ash Bin KF04271 Pack of 1 Q-Connect ashbin. 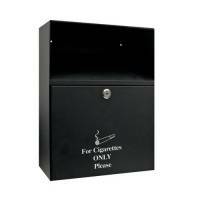 Wall mounted ashtray keeps outdoor smoking areas clean and free from cigarette ends etc. Dimensions: 240 x 90 x 300mm. Q-Connect Black 7 Litre Ash Bin Pack of 1 "Q-Connect lockable wall mounted ash bin with built in extinguisher, cylindrical lock with two keys and removable ash box for easy emptying. Complete with wall mounting kit. Capacity 7 litre." Silver Outdoor Freestanding Ashtray Pack of 1 Fully weather-resistant outdoor ashtray with weighted base for stability. Can be secured to the ground or to wall. Lift-out galvanised container for easy emptying. Dimensions: H81 x W18 x D13 cm. 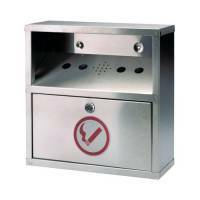 Sterling Steel Wall Mounted Ash Bin 5.5 Litre CIGBINSQ Pack of 1 "A weatherproof wall mounted ash bin with an angled, slotted covered front for cigarette waste collection. Lockable easy access drawer for removal of waste. Marked with Smoke Waste collection symbol. Wall mounting kit included. Capacity: 5.5 litre." 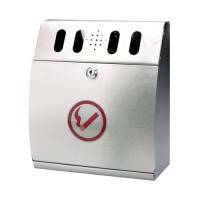 Sterling Steel Curved Wall Mounted Ash Bin 3.7 Litre CIGBINCRV Pack of 1 "A weatherproof wall mounted ash bin with an angled, slotted covered front for cigarette waste collection. Lockable easy access drawer for removal of waste. Marked with Smoke Waste collection symbol. Wall mounting kit included. Capacity: 3.7 litre."